About 1 month ago, I wrote about the Shimano Shadow Plus rear derailleur, and how it can be converted from a standard dropout mounting to a Direct Mount dropout. In this second part of the article, I will describe briefly how to adjust the clutch mechanism in the Shadow Plus RD. 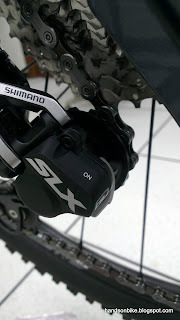 The RD that I am operating on is the new SLX Shadow Plus RD, model number RD-M675. 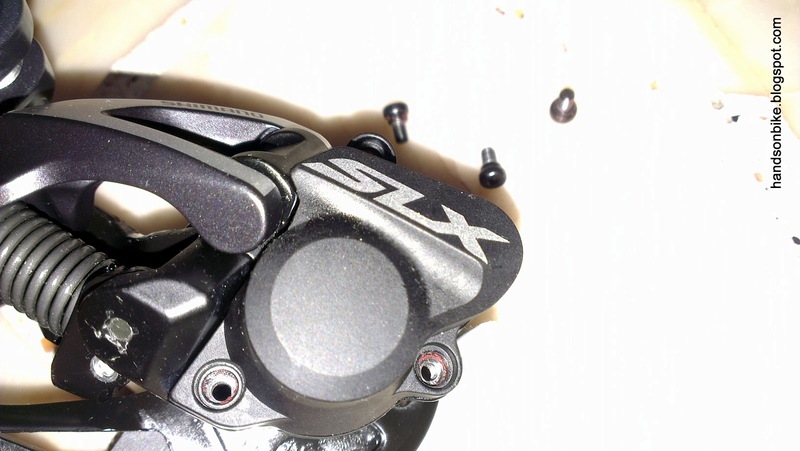 The construction of the clutch mechanism is quite similar to the XT and also upcoming Deore Shadow Plus RD. 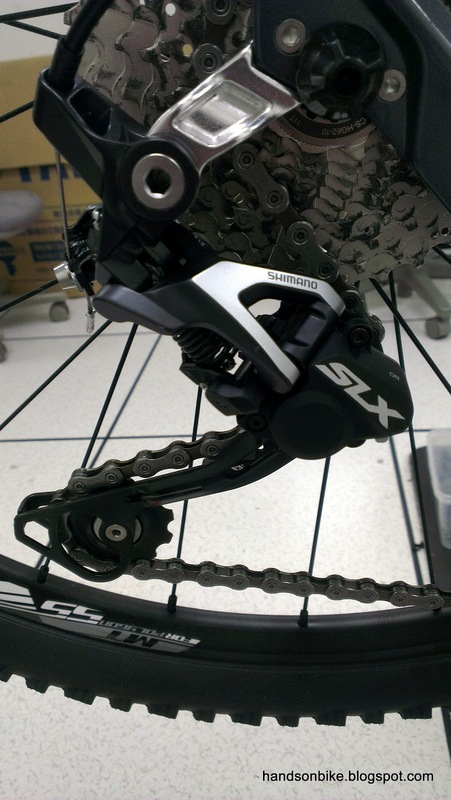 The mechanism is slightly different from the top-end XTR RD, but the adjustment principle is the same. Before adjusting the clutch mechanism, set the switch to the OFF position. This is to release any spring tension in the clutch mechanism and to make it easier to adjust the mechanism. Before we go further, I am sure you want to know what you are adjusting! Sorry for not making that clear right at the beginning. What we intend to adjust on the Shadow Plus RD is the amount of resistance in the clutch mechanism. The clutch mechanism works by creating resistance to the RD cage movement. 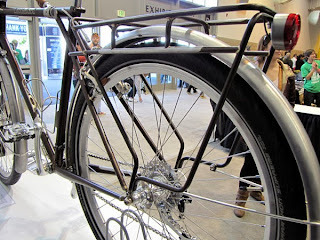 When traveling over rough terrain, the whole RD bounces around, and the bottom of the RD cage tends to swing forward/downward, causing a loss of chain tension and subsequently leading to chain drop. When the one way clutch mechanism is turned ON, the cage resists any forward/downward movement, while still allowing the cage to rotate backwards easily. This ensures that chain tension is maintained, greatly reducing any chance of chain drop. The downside of having a strong clutch is a higher shifting force at the shifter. Therefore, it is good to be able to adjust the clutch mechanism. Too light, and the clutch mechanism will not be effective in preventing chain drop. Too heavy, and it will be tiring to shift gears. The optimal setting is when the amount of resistance is just sufficient to prevent chain drop, while also minimizing the effort required to shift gears. When adjusting the clutch mechanism, it is OK to leave the RD on the bike, as long as the switch is set to OFF and there is no pedaling. The first step is to remove the 3 bolts securing the cover to the RD. Once the cover is removed, the clutch mechanism can be seen clearly. How it works: When the switch is turned from OFF to ON, a metal clamp band wraps and tightens around the one way clutch, creating resistance to cage movement. The tighter the clamp band, the more resistance there is. Therefore, what we are adjusting is the tightness of the metal clamp band. One way clutch in the middle, with metal clamp band wrapped around it. Adjustment nut can be seen at the top left corner. 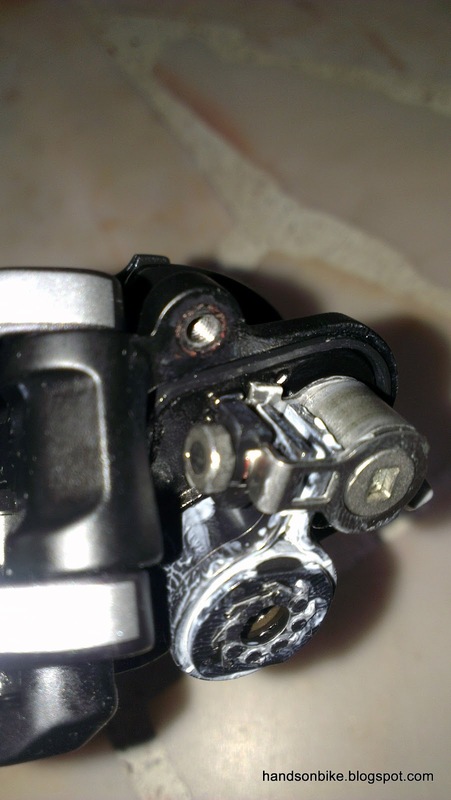 Adjustment nut located on the left side of the mechanism. Turn the adjustment nut to adjust the tension on the clamp band. Turn the nut in minor increments, as even a quarter of a turn can cause a significant difference in resistance. It is difficult to judge exactly how much tension is needed, as the bike is not in an actual riding condition. For myself, I set the tension such that when I pull lightly on the cage, it does not rotate. When doing the adjustments, avoid poking around the rest of the mechanism. If grease gets into places where it should not be, it may cause the clutch mechanism to malfunction. Different riders on different terrains will need different amounts of clutch resistance. As I do not foresee myself going on super rough terrain, I will not need very high clutch resistance. In the end, the only way to find the optimum setting is to go for a ride, and make adjustments depending on the result. If you find yourself still getting chain drops, you may need to increase the resistance. If you get zero chain drops, you may have found the optimum resistance for yourself. You can even try reducing the resistance slightly, to reduce shifting force while ensuring that the clutch mechanism is still effectively preventing chain drop. After adjustment, remember to close the cover, making sure that the rubber seal sits properly in the groove around the cover. Tighten the 3 bolts and you are good to go! Recently I had the chance to see how well the clutch mechanism works. On a long flight of stairs, some of my friends took turns to ride different mountain bikes down the steps. As you can imagine, riding a hardtail MTB down a flight of stairs can be really rough, dangerous even. On other MTBs without the Shadow Plus RD, the chain often dropped off just halfway down the stairs. By the bottom of the stairs, all the MTBs already had dropped chains. 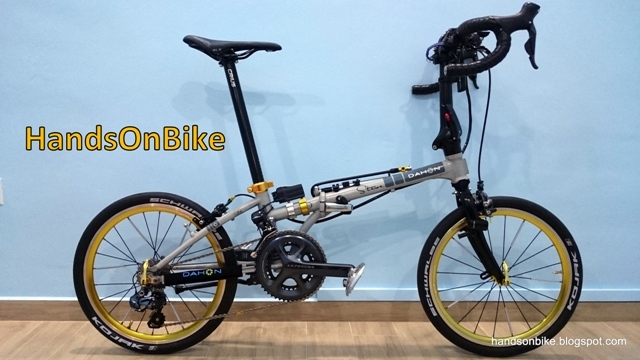 For my Polygon MTB, it was first tested with the clutch mechanism OFF. This meant that it functioned just like a normal RD. 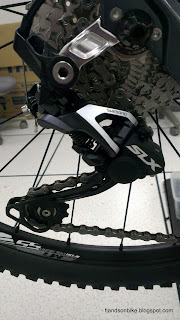 As expected, the chain dropped off the gears by the time the bike reached the bottom of the stairs. We then tried the run again with the clutch mechanism set to ON. The results were pretty amazing. Looking at the RD as the bike went down the steps, it is clear that with the clutch mechanism ON, the RD only bounced slightly, preventing any loss of chain tension that would cause chain drop. When the clutch mechanism is OFF, the RD would swing wildly, with the chain whipping about furiously and eventually dropping outside the gears. With this easy experiment, it can be clearly seen that with the clutch mechanism activated, the chance of a chain drop is greatly reduced. Although the shifting force is increased, it is a small price to pay for chain security without the need for any external chain retention devices. The ability to turn the clutch mechanism ON or OFF is also very useful. When traveling on smooth roads, the clutch mechanism is not required, and thus setting it to the OFF position will reduce shifting force. It only needs to be turned ON when tackling rough terrain. 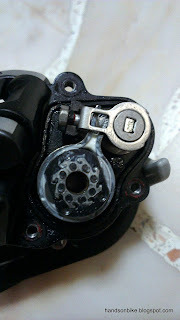 After reading this article, you should have a pretty good idea on how the clutch mechanism works, how to adjust the mechanism, and why it is useful. Depending on your riding style and terrain, you may find this Shadow Plus feature very helpful in preventing chain drops.